Today I took delivery of a big box of decopatch papers and glues from France. I'd given up on trying to source the papers I wanted from the UK and I just couldn't wait any longer. I've been wanting to decopatch my Robox - even before I got it! I've just been surfing their website and I couldn't believe some of the thing that people have covered in the stuff. I showed my other half some of the photos via Messenger this morning and I think he's seriously worried about what he's going to come home to this weekend. There were pictures of wardrobes, plates, dining sets, cars, trucks... 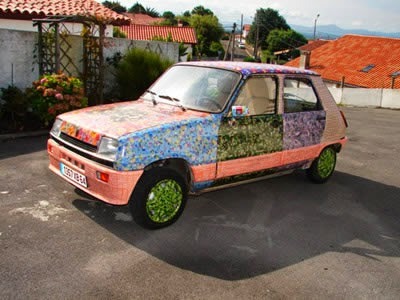 I'd love to cover my Micra in decopatch! How camp would that be? !